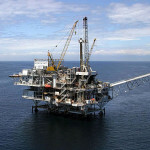 Offshore hydraulic fracturing — a method of extracting oil and natural gas — has been occurring off the Santa Barbara coastline. Senators Hanna-Beth Jackson (D-Santa Barbara) and Noreen Evans (D-Santa Rosa), who represent coastal districts, told Mary Shallenberger, commission chair, in an Aug. 8 letter that many unanswered environmental questions still exist regarding onshore fracking. The pair is asking additional studies of potentially negative impacts. The lawmakers said that enough is known about “proven and potential impacts of tracking fluids” to justify additional investigation. In the fracking process, fluids are injected into the ground to break up rock formations and release oil and gas. It is controversial because of its potential effect on subterranean water supplies. Hmmm…No off-shore drilling, no on shore drilling, no seismic testing, no nukes, no solar farms, no wind farms, no water, no pipeline, no sewer, no dust, no property development…anybody see a trend here? Prince Alwaleed bin Talal is quite worried about fracking and its effects on Saudi Arabia. So much so, he is funding a LOT of efforts to lie about the nature of the beast. The beast’s true nature is the future of Saudi oil exports (as much as 92% of SA’s economy). Don’t believe me? You can read about it yourself. While I believe that fracking isn’t as universally dangerous as some people claim, there have been legitimate incidents where it has resulted in pollution of local water sources and it may have contributed to minor earthquakes in another area.. Just because someone has an economic motive for opposing oil and gas development in the US doesn’t mean that there isn’t good reason to be careful about its use. Obama bowed to the Saudi King early on in his first term…you don’t have to kick me in the head. It’s a scientific fact that fracking, which alters the balance of pressures under the Earth’s surface, can facilitate earthquakes. Wow. I wonder what harvesting natural GAS would do, then… or draining an aquifer of water. Just something to think about, as well. Hey! Finally, a good link! Nice, zaph! I did! It is really “Desktop wallpaper” worthy! Nice find, again. WiserGuy, I’d like to see some actual scientific proof of your statement. Is that akin to the “scientific fact” that global warming/climate change is a man caused issue? 97 % of climate scientists agree , how do you spell consensus? and another thing…if we are going to change everything about our society and harm lives and the livelihood of people world wide in the process I want more than a “consensus” I want proof…and so should you. consensus is when scientist agree on the accuracy of the data. If science is not a religion, why does it take FAITH to believe in Evolution? when the Pope was asked a similar question he replied “things change” epigenetics is where its at. Lawmakers often tell lies but they are not called Liemakers. It will be interesting to hear their reason for being upset about the fracking oil? They are just ticked off because California is not getting their tax, permits, fees, fines, assessments, etc..$$$ Believe it or not they do not control the universe. Exactly. Fracking is expensive. Which means there’s money changing hands.